A montage of iHeart90s JAM jingles from 9 continuous hours yesterday via the iHeartsRadio stream. You've been busy, well done! Blimey, Jon's been busy with all these resings for all these channels. Couldn't be happier*. * except if they were proper radio stations rather the equivalent of iTunes mixes. The programming of my diswasher is more interesting that that channel. There is so much great JAM stuff that and production you could do to make the channel rock. It sounds like its designed to play in Malls to be honest .....iheart90s may have heart but no soul! The jingle selection is limited, the non-sung imaging does leave something to be desired, and of course there are no DJ's. Still, the jingles they do have are great, and the music is right up my alley and well-programmed, so I do find myself listening a fair amount. Silly question but how do you listen to any of these iHeart decades? I went to their main site and couldn't even get the main page to load properly.. The iHeartRadio streams aren't geoblocked, you just need a 'sideloaded' iHeartRadio app installed and no need for a VPN. Quite easy on Android, but no idea about how to do that on Apple phones. You should then be able to share it to a TV set, or bluetooth radio in the car. You can use the FREE version of RadioSure. After installing and running, search iheart70s or whatever. Double click on the result to play the station. Right-click on a playing station to add if to your favourites list. When done well ( as is the case with Vinyl Heaven - http://www.vinylheaven.co.uk ), a station without jocks playing continuous music can sound fantastic. But at the moment, both the 80s and 90's stations need a lot of work doing on them to bring them up to scratch. I'm sure those on here who work in radio, those who use playout software in their stations, and those who do music programming recently are thinking "give me a week with it - I'd tighten up the segue, sort out the music programming, and how the imaging should work.."
I forgot to mention the stations list would need updating as it could be pretty old. Exit RadioSure so that it is not running. Download the latest stations list and extract it. Put the latest file, stations-2019-02-03.rsd, from the .zip you downloaded into the stations folder. Start RadioSure. I double-checked the current station list & both iHeart50s and iHeart60s aren't currently included, so you'll need to add them yourself 1 at a time. 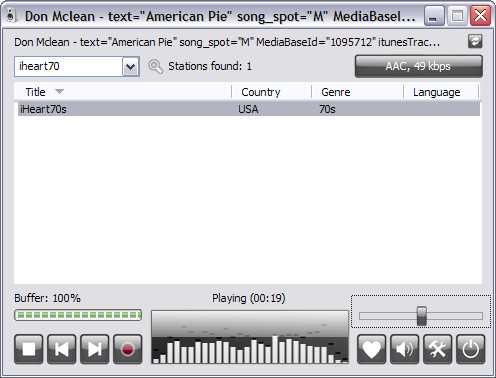 Right-click anywhere on RadioSure's interface>Add new station. Enter your own station details (Title, Genre etc.). (Either copy and paste the Source URLs or type them manually). Thanks Mike.....Yes added these two manually BUT the actual Radio Station List updated automatically after being on for about 15 minutes! Incidentally I had a (short) listen to the Australian version of iHeart….Jingles yes but Dallas no! !